Lowdown: A Mass Effect comic providing the Illusive Man’s background story. 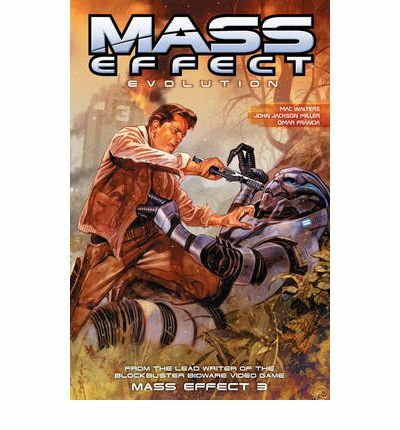 As far as comic books whose purpose it is to fill in the background story behind computer games, the second Mass Effect comic book, Mass Effect: Evolution, does quite an intelligent job. It almost goes without saying this comic will not appeal to those unfamiliar with the Mass Effect world. This time around the focus is on the character of The Illusive Man. Hey, the book even explains the name's weird spelling! It also adds a bit more to Sarin’s background story, explaining why this alien does not favor humans even at the pre Mass Effect 1 times described in Mass Effect: Revelation. The story is set during the First Contact War. Humans have just started venturing into the galaxy; they step on the Turian race on their way. The Turians fight back, and bloody war results until the Council (the galaxy’s UN) steps in to restore peace. Before that peace is achieved our would be Illusive Man captures a Turian general and finds himself and his friends in the thick of a mystery involving ancient artifacts with a will of their own. Yes, included in the human characters is the Mass Effect obligatory big breasted woman, this time with a constantly varying zipper running her cleavage's operations. The resulting struggle tells us where The Illusive Man’s “racist” Cerberus came from. As with Mass Effect: Redemption, the art in Evolution is fantastic. I would say it’s even better with things looking less animated and more realistic but still maintaining that arty look I love about comic books. Where Evolution lacks in comparison to Redemption is character identification: there is no Liara like characters to carry the plot on her shoulders; no one here is particularly lovable. 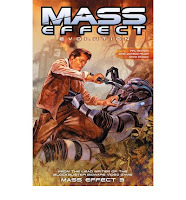 Mass Effect: Evolution carries with it an extra punch is the form of two other short Mass Effect world comic book(lets). The first is Mass Effect: Incursion, which follows Aria just before the plot of Mass Effect: Redemption takes place. The second is Mass Effect: Inquisition, which fills in some background on the Citadel’s Captain Bailey and Ambassador Udina and sets the scene for Mass Effect 3. Overall: A worthy addition to the Mass Effect canon. 3.5 out of 5 stars.